Leslie Bernsen and Connie Tunick began thir unique collaboration while attending a printmaking class at a community college in January 1998. Each had been in the class for several semesters and each was seeking a unique approach to print-making. Both artists had been working as professional artists for many years. Bernsen's background is in textile design, while Tunick's is in art education. Bernsen works on large canvases, painting in acrylics and often incorporating collage into her work. Tunick's paintings are watermedia and the themes are frequently nature oriented. 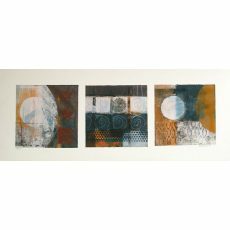 Both artists use mixed media freely, and are highly versatile. They both enjoy experimental art and are continually expanding and developing their styles and creative visions. Their collaboration was a learning process, and their efforts have developed an art style that possesses its own unique identity, one that is completely different from either artist's individual work. While it is unusual for two artists to work together, Leslie and Connie were enthusiastic about their collaborative efforts. As a result of their enthusiasm, in July 1998 they decided to buy a press and open their own studio in Newbury Park, California. The studio is aptly called A Double Vision. The art created there is the vision of two artists, with each creating half of every piece that has the Bernsen/Tunick signature.